On August 28, 2017 a Johnson City resident filed a report with the Kingsport Police Department concerning fraudulent charges on her debit card. Further investigation revealed that three charges, for a total of over $350, had been made two days earlier on August 26, 2017 at two separate locations inside the City of Kingsport. One of these locations was West Kingsport Package Store, located at 2217 West Stone Drive, while the other location was Intimate Treasures, located at 846 Bloomingdale Pike. The original debit card was still in the possession of the victim, so this is evidently a case of her debit card being fraudulently cloned. 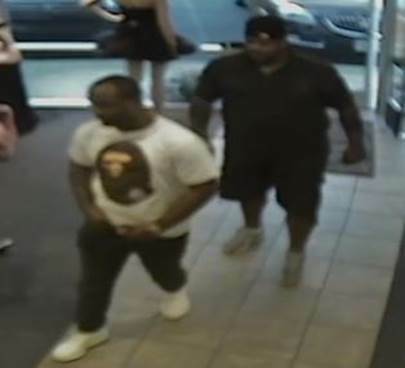 Anyone who recognizes either of these men is asked to contact Detectives in the K.P.D. Criminal Investigations Division by calling 423-229-9429 or call Kingsport Central Dispatch at 423-246-9111.